AffiliateWP has become the go-to solution when building an affiliates program to your online business. WP Ultimo: AffiliateWP is the bridge that will enable you to build the same thing for your premium network. First of all, you need to have AffiliateWP active! You won't be able to use our add-on if you don't have the plugin that integrates with it. In case you don’t plan to let your clients use it on their sites as well, AffiliateWP should be active only on your main site. Also, you’ll need both WP Ultimo and WP Ultimo: AffiliateWP activated network-wide. 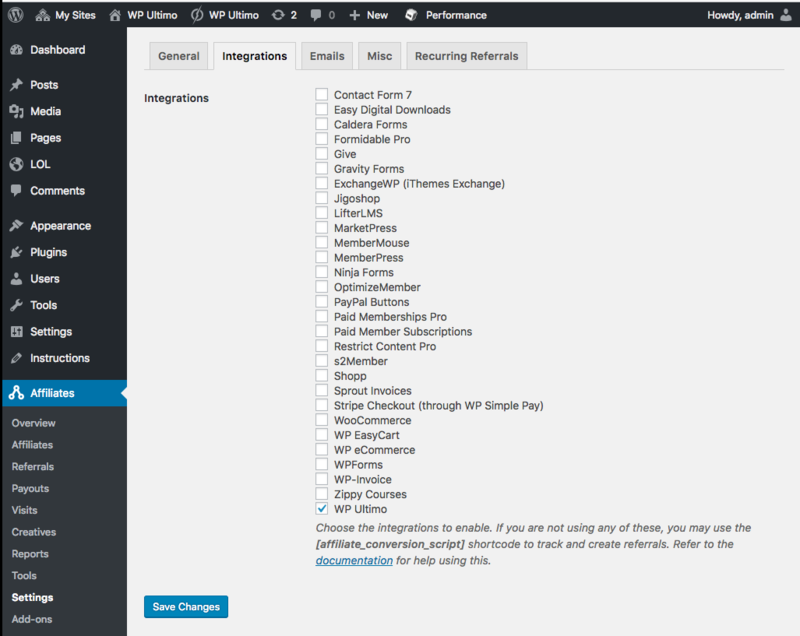 On your main site, head to Affiliates Settings, and on the Integrations tab, check WP Ultimo. This will tell AffiliateWP to start tracking visits and conversions from the WP Ultimo sign-up flow. That’s pretty much all that it takes. Visits coming from referral links will be tracked and when that user later makes his first payment, the conversion will be created and a commission will be put aside to the affiliate responsible for the conversion. After installing the AffiliateWP Recurring Referrals Add-on, head to Affiliates Settings Recurring Referrals tab, and enable the use of recurring referrals. As simple as it gets: Enable Recurring Referrals and you’re all set! Again, that’s all it takes! Now, every time a new payment is received on a referred account, the affiliate responsible will get its own cut automatically!